The Doors in the Sky (2007) for violin commissioned by and is dedicated to violinist Piotr Szewczyk. It was written as a part of his ViolinFutura commissioning project. 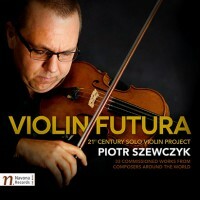 The mission of the project seeks to commission pieces connected to the deep historical traditions of solo violin literature. The work takes its inspiration thus from these historical works and also from a brief poem by American poet Elizabeth Kirschner. The work begins with slow, melodic music in firm tonality. A fast, dancing section emerges and becomes gradually wilder—abandoning its tonal grounding through chromatic alternation. After this fast music stops, the initial slow music returns to conclude the piece, with darker interjections now inserted into the tonal texture before ending in quiet repose. sing back to you as if they had been granted.